If you’re looking for a likely catalysts for the Greenback before the trading week ends, then heads up because the advanced Q3 GDP report will be released on Friday (October 27, 12:30 pm GMT). And it just so happens that I have an Event Preview for it. Oh, for the newbies out there. 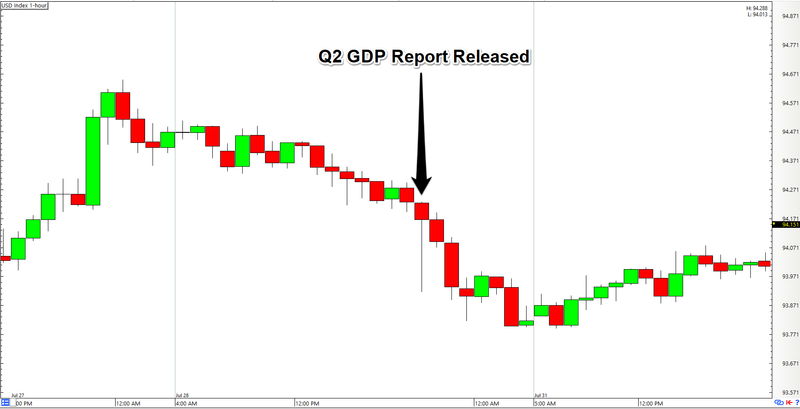 The U.S. GDP report is the most comprehensive report on the performance of the U.S. economy, so it’s important to forex traders and policy makers alike. And it comes in three flavors: (1) the first or advanced estimate (2) the second or preliminary estimate, and (3) the third and final estimate. And the GDP report scheduled for release tomorrow is, as the title says, the advanced or first estimate. The advanced estimate tends to get revised as new data come to light, but since it gives the earliest glimpse on the U.S. economy’s performance, it also usually triggers a reaction upon release. The advanced estimate for U.S. Q2 GDP growth was released way back on July 28 And it was revealed that the U.S. economy expanded by 2.6% quarter-on-quarter annualized (0.64% not annualized) in Q2. 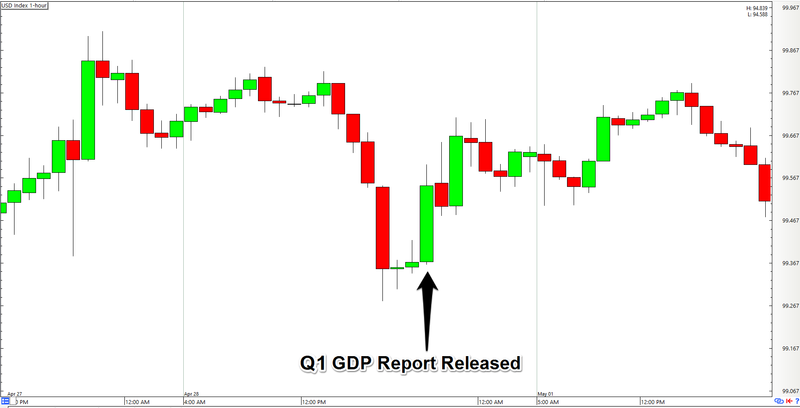 Unfortunately, the reading for Q1 was revised lower from +1.4% to +1.2%. Even so, the strong rebound in Q2 effectively puts an end to two consecutive quarters of ever weaker growth. And looking at the details of the GDP report, stronger consumer spending (+2.8% vs. +1.9% previous) was the main driver for the stronger reading. Although the sharp recovery in private investment also helped (+2.0% vs. -1.2% previous). Meanwhile, the main drag turned out to be net trade, thanks to weaker exports in Q2 (+4.1% vs. +7.3% previous). Looking at the other details of the GDP report, it was also revealed that the GDP price index only increased by 1.0% quarter-on-quarter annualized, which is a drastic slowdown compared to the previous quarter’s +2.0%, as well as a stronger deceleration compared to the consensus that it would slow to 1.3% in Q2. Worse, the weaker headline reading for the GDP price index was due to the significantly weaker increase for the personal consumption expenditure (PCE) price index (+0.3% vs. +2.2% previous). Overall, the advanced estimate for Q2 U.S. GDP was mixed. However, the GDP price index weakened, which is a bad sign for inflation, and is very likely why Greenback bears won out in the end. Although Greenback bulls did try to fight back at first. 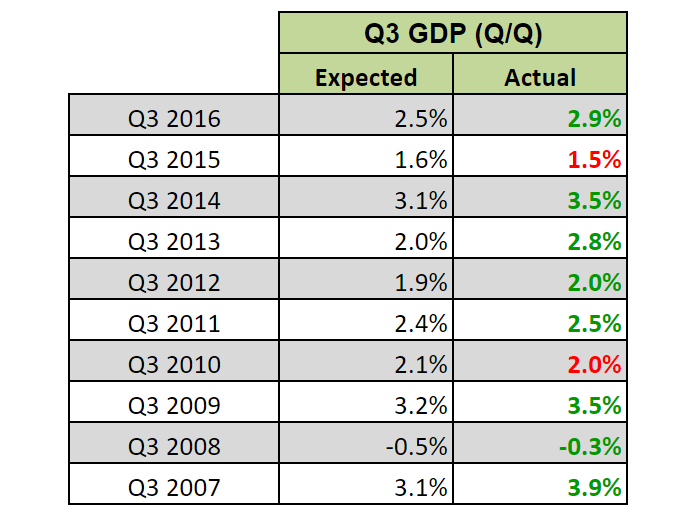 What’s expected for Q3’s GDP report? Most economists forecast that U.S. GDP only grew by 2.5% quarter-on-quarter annualized in Q3, decelerating from Q2’s final estimate of +3.1%. However, Q3’s GDP price index is expected to pick up the pace in Q3 by printing a 1.7% quarter-on-quarter annualized increase after Q2’s disappointing 1.0% rise. Looking at the available components for GDP growth, retail sales for all of Q3 is 0.94% more compared to Q2, so consumer spending likely strengthened in Q3. Trade, meanwhile, is still incomplete because we have yet to recieve September’s trade data. However, the available trade data for July and August do point to a pickup in exports and a slide in imports. Exports therefore likely rose further in September, so it’s highly probable that net trade would have a positive contribution to Q3 GDP growth. Moving on, economic reports related to fixed private investment are painting a more mixed picture while the buildup in inventories will likely have a positive contribution to Q3 GDP. Let’s now switch to components of the the GDP price index. And, well, they’re not conclusive since the reports for September are not out yet. But housing prices did increase by 0.4% in July and then by 0.7% in August. The PCE price index, meanwhile, increased by 0.10% month-on-month in July and then increased by 0.21% in August. And while the the PCE price index does not always follow CPI, September’s CPI increased by 0.5%, which is faster than August’s CPI reading of +0.4%. Given all that, it’s therefore likely that the GDP price index did rise at a faster pace in Q3. As for historical tendencies, economists tend to be too pessimistic and undershoot their guesstimates for GDP growth since there are lopsidedly more upside surprises than downside surprises. Economists also tend to be too pessimistic when it comes to the GDP price index, so there are also more upside surprises. Okay, let’s now take a look at some of the popular (yet publicly available) GDP forecasts from other institutions. First up is the Atlanta Fed’s GDPNow. And as of October 25, it’s forecasting that Q3 GDP grew by 2.7%, which is faster than the consensus for a 2.5% rise. The New York Fed’s Nowcast, meanwhile, is much more pessimistic since it’s forecasting a +1.46% growth rate as of October 20, which is way below the consensus +2.5% read. And a brief look at the New York Fed’s model shows that the pessimistic forecast was due to expectations that fixed private investment will have a negative impact. As for Moody’s Analytics, it’s forecasting a 3.4% rate of expansion as of October 24, which is super optimistic since that’s stronger than the consensus reading of +2.5%, as well as the previous quarter’s +3.1%. The consensus among economists is that GDP growth will slow while the GDP price index will bounce. However, the available GDP components and leading indicators seem to be leaning more towards stronger GDP growth in Q3, which is contrary to the consensus that Q3 GDP will only grow by 2.5%, slowing from Q2’s final estimate of +3.1%. Moody’s Analytics has come upon this conclusion as well since it’s forecasting a growth rate of 3.4%, which is faster than both the consensus reading and the previous quarter’s reading. Moreover, the Atlanta Fed’s GDPNow, which usually has a forecast that’s below the consensus reading, happens to be forecasting a 2.7% rate of expansion, which is above the +2.5% consensus. And with regard to the GDP price index, the PCE price index (supplemented by CPI) and HPI are also pointing to an acceleration, so the consensus that the GDP price index will pick up the pace from +1.0% to +1.7% sounds about right. However, economists have a strong historical tendency to be too pessimistic with their guesstimates. And as a a result, there are more upside surprises for both GDP growth and the GDP price index, which obviously skews probability in favor of upward surprises for both GDP growth and the GDP price index. And on that note, forex traders used to have their sights on GDP growth. However, forex traders are now apparently more focused on the GDP price index since that’s more directly linked to inflation and, by extension, rate hike expectations. The Greenback’s bearish reaction to Q2’s advanced GDP report is evidence of this. Remember, I mentioned earlier that Q2’s GDP growth reading was better-than-expected but the GDP price index missed the mark, so more Greenback bears came out to play. The Greenback’s bullish reaction to Q1’s advanced GDP report is also evidence that forex traders are more focused on the GDP price index. Back then, Q1 GDP printed a dismal 0.7% growth rate, which is way off the +1.3% consensus and a significant slowdown from Q4 2016’s +2.1%. However, Q1’s GDP Price Index came in at +2.3%, beating expectations that it would increase by 2.0% expected and accelerating from the previous quarter’s +2.1%.